Dr. Joanna Xie is a recognized pathologist in West Hollywood, California. She received her medical diploma from the University of California San Diego School of Medicine in 2006. Dr. Xie completed her medical education with a residency in anatomic and clinical pathology at Cedars-Sinai Medical Center and a fellowship in selective pathology at the University of Southern California – LAC+USC Medical Center. She is certified by the American Board in cytopathology, anatomic pathology and clinical pathology. 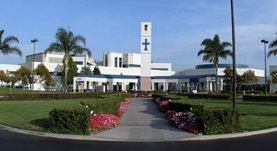 This doctor works in several hospitals in the area, including: St. Mary Medical Center, St. John's Pleasant Valley Hospital, Northridge Hospital Medical Center and St. John's Regional Medical Center. In 2014, together with other doctors, she published the article “Neurotrophins differentially stimulate the growth of cochlear neurites on collagen surfaces and in gels. Dr. Joanna Xie has contributed to 1 publications. Neurotrophins differentially stimulate the growth of cochlear neurites on collagen surfaces and in gels. Xie, J.,Pak, K.,Evans, A.,Kamgar-Parsi, A.,Fausti, S.,Mullen, L.,Ryan, A. F.; Neural Regen Res. 2014 Jan 25.